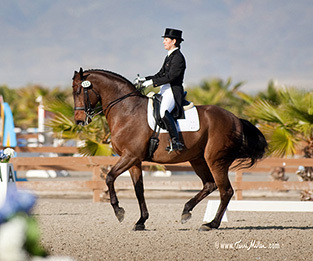 Templeton Farms Equestrian is the Realization of Gina Bornino Miller's Dream to Build a World-Class Sport Horse Training, Sales, and Breeding Facility for Both Horses and their Riders on California's Central Coast. In 2001 my husband Bill and I decided to leave the hustle and bustle of Southern California for a quieter life in the wine country of Paso Robles. We made the assumption that, being horse country and all, finding a good facility for my dressage horses would be easy. Although there are many horses and barns in the area, most focus on the western disciplines. I couldn’t quite find the kind of facility that I was looking for to train my horses. I began making the commute back to San Diego to train and ride! Of course my horses and I tired of the long drive and, after a few years, we started thinking that if we couldn’t find the right facility, perhaps we should try to create it ourselves. We considered building a private facility on our property at home, but that didn’t seem like a good idea. I knew I would miss the camaraderie of other horses and riders crazy enough to be interested in sport horses, and the economics of a small barn simply don’t allow for the necessary facilities to train a competitive sporthorse. With that, we decided to think bigger instead of smaller and the dream of Templeton Farms Equestrian was born. We were fortunate to find a perfect 52 acres along the Salinas aquifer that had good topography, plenty of water for grass pastures, and was easily accessible from the reaches of San Luis Obispo County. After 4 years of planning, permitting and building, Templeton Farms opened for business in August of 2011. We wanted to create a barn that is a unique combination of niceties for the humans and attention to the details needed to efficiently and effectively build a better sporthorse. We believe the result is one of the best sporthorse facilities on the West Coast. We hope that you will agree and we look forward to seeing you at the farm soon.